Visualize a Caribbean island. Warm sea breezes, an azure sky with cotton candy clouds lazing over the horizon, rustling palm trees, fragrant tropical air. Soothing tones from ceramic wind chimes drift from wooden balconies above blue cobbled streets. We’re in San Juan, Puerto Rico. Atmospheric without a doubt, but staying within the old city means you won’t be sampling the full local flair. To really delve into local culture, venture out to Río Piedras and take a look at the fantastic covered market there. Hail a cab or jump on the new Tren Urbano (metropolitan railway) at the Sagrado Corazón station, just a 10-minute ride from Río Piedras. Then be prepared to experience a different Puerto Rico! Río Piedras is the university district of San Juan. Full of color and life, this is where the locals go shopping. The main attraction is the market, the Plaza del Mercado de Río Piedras. From the metro station, take a short stroll along Paseo de Diego. This section of the street is pedestrianized and stalls spill out into the open air. Bright yellows, reds and blues dominate, with everything from carpets to gaudy Caribbean shirts on display, the stallholders vying good-naturedly for customer dollars. You can hear it, too. There are men selling cheap CDs from handcarts. Their humming beat offers a whistle-stop musical tour of the island. Bomba, plena, salsa, reggaeton … there’s something for all tastes. Stop and chat with El Rey de las Frutas (the King of Fruit), 92 years young and a real gentleman. 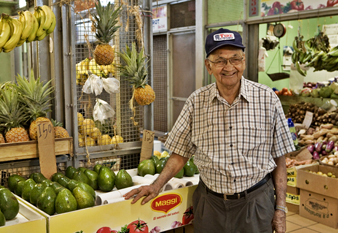 He’ll tell you of the changes he’s seen in the market since he first began working there 60 years ago. 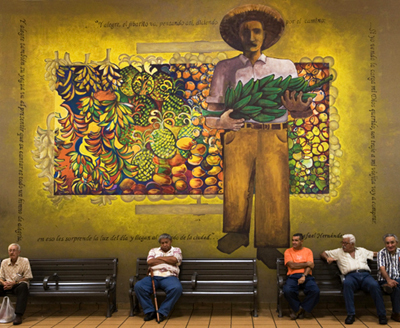 Pause in the center of the hall, in front of the larger-than-life mural depicting the song "Lamento Borincano" by Rafaél Hernández Marin, one of Puerto Rico’s most prolific composers. It tells of a poor jibaro, or countryside peasant, down on his luck because he can’t sell his wares at the market. Today, elderly Puerto Rican men congregate here to catch up on the latest gossip. Two arcades flank the main market hall with small shops selling everything from musical instruments to hardware. 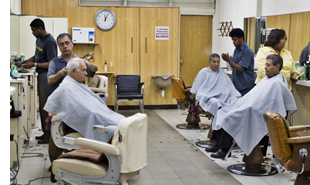 Men can even drop in for a haircut at the traditional barber’s shop, so traditional that a sign demands, "Si estamos trabajando, necesitamos SILENCIO" (“If we’re working, we need SILENCE!”). Just the clipping of scissors and the occasional "a bit more here, please," punctuate the otherwise serene atmosphere. The market is also the place to buy San Juan and Puerto Rico souvenirs at prices far below those of Old San Juan. When it’s time for lunch you’re spoilt for choice. Home in on the waft of Creole fried fish and you’ll be magically drawn to the market’s simple but varied food court. Find a table, get a drink from one stand (try a tropical batida—healthy, no-fat and freshly-made), order a main course from another, and engage in some entertaining people-watching while enjoying your delicious, great-value lunch. Here, you’d be hard-pressed to spend over $10. You won’t be disappointed. Just a short trip from Old San Juan delivers you to Río Piedras. See a bit more of local life in Puerto Rico!